SOURCE: "FLOYD'S NOT THE PRIORITY...TIM BRADLEY IS NEXT FOR MANNY PACQUIAO IN 2012"
"They can forget about Mayweather vs. Pacquiao. Floyd's not the priority. There's no doubt Tim Bradley is next for Manny Pacquiao in 2012," commented one well-respected boxing insider, who chose to remain anonymous, when asked their opinion about Top Rank's latest addition to their roster, WBO jr. welterweight champion Timothy Bradley. On Thursday, officials at Top Rank confirmed the signing of Bradley, who will make his debut with the promotional company on November 12 when he takes on former lightweight champion Joel Casamayor on the undercard of Pacquiao vs. Marquez 3. According to our source, Bradley's signing with Top Rank has been in the works ever since late April, when he turned down a career-high guaranteed payday of $1.2 million to face fellow jr. welterweight champion Amir Khan. It was a risky move that left many scratching their heads, particularly since Bradley has never been a major draw to warrant that kind of money. Evidently, Bradley knew something that the rest of the world didn't. "Of course he knew he would get a fight with Pacquiao. When you have that much money on the table, more than you've ever made in your career, you don't walk away from it unless you have a backup plan," our source explained. 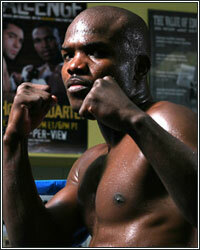 "Look, they probably just did the same thing with Bradley that they did with Shane [Mosley]. They flew him out, wined and dined him, and then promised him Pacquiao. Once they did that, Bradley did the smart thing and left Gary [Shaw]. Before Shane even stepped into the ring to face Pacquiao, Tim already knew he'd be doing the same thing a year later; just like how Shane knew he would be fighting Pacquiao before Margarito stepped into the ring to face him. Bob [Arum] isn't just two steps ahead of everyone anymore; he's three steps ahead of them." Indeed, as early as May, Arum revealed that Timothy Bradley was on a short list of potential future opponents for Pacquiao. "If they don't match, we'll fight Juan Manuel Marquez in November. If they match, then we'll look to fight either Timothy Bradley or Zab Judah," Arum would comment as he talked about Pacquiao's future plans during the post-fight press conference after his lopsided unanimous decision win over Mosley. Bradley was in attendance for that fight, just as Shane Mosley was in attendance for Pacquiao's lopsided unanimous decision win against Antonio Margarito. In fact, according to a conversation I had with Mosley, he was personally invited to attend Pacquiao vs. Margarito and was told, before the opening bell, that he was next in line for a shot at the 8-division world champion by Pacquiao's adviser, Michael Koncz. Sure enough, just one week after that fight, Mosley revealed that he was "90% sure" a fight with Pacquiao was a done deal. Mosley would later tell me that a private dinner at Casa de Arum, where he was treated like royalty by Arum and his family, would essentially seal the deal before, a month later and nearly 6 months before the fight, he officially announced that he was Pacquiao's next opponent. One can easily envision a similar scenario with Bradley, who seemed all too eager to turn down a $1.2 million offer to face Khan, even after Golden Boy Promotions upped the offer to $1.4 million and Khan offered Bradley a 50/50 split of the UK pay-per-view buys just to make the fight, something that he did not have to do. His decision to walk away from such a generous offer just so happened to be in May, roughly a week after Pacquiao defeated Mosley. Coincidentally, at that same time, lightweight champion Juan Manuel Marquez was putting pen to paper to close the deal to face Pacquiao on November 12. So essentially, it appears as though Bob Arum and Top Rank were already lining up Pacquiao's next two opponents at the same time. Given this knowledge, one has to wonder just how much they truly want to make a fight between Manny Pacquiao and Floyd Mayweather. If there's any doubt, just wait until November. After Pacquiao walks through Marquez, you'll hear more stories from Arum about how WADA, not USADA, must handle any testing protocols during training in the Philippines, despite the fact that WADA themselves have made it clear that they don't do the collecting of samples. You'll also hear Arum express his concerns about Mayweather's legal issues potentially getting in the way, despite the fact that Mayweather's legal issues did not prevent him from fighting Ortiz in September. Once again, blame will be placed on Mayweather shortly before it's announced that Pacquiao vs. Bradley is a done deal...even though it already became a done deal the minute that Bradley officially signed with Top Rank.